Scrappin with my Bug Happy Birthday Blog Hop! My sweet friend Michelle from Scrappin with my Bug is having a birthday! We're celebrating by gathering a bunch of fun ladies for a big blog hop that is going to run all weekend long. Lots of fun stuff to see along the way and prizes galore! Be sure you stop at Michelles blog first to wish her a Happy Birthday! Front of the Gate fold card. I used rub on dots for the top and bottom, 2 buttons to wrap the bakers twine around and cut the flowers from Walk in my garden. The stamps are misc Birthday stamps and the paper is all DCWV various stacks. I inked around the flowers with chalk ink (cats eye I think it's called) Oh and the rub on dot borders are from Stamping Up. I'm brand new with rubber stamps and will eventually learn how do do it correctly. Inside of the card. 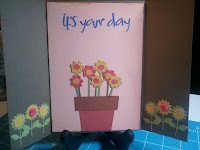 It's your Day is from Pink Cricut - one of her stamp sets.... sorry don't remember which. Paper is from DCWV and I inked a lil here and there. How cute are these flowers? I tried to bunch them more carefully but the more I tried the more cross eyed I felt so I gave up. I still think they are adorable. I wish I had done something to the flower pot and I still may later. This is a border cut from the cartridge. The center of the flower in the middle is a fuzzy type brad. Cute card. Love the flowers. How cute!! The flowers are ADORABLE!!! Very cute card!! I really need to make a gate card....they are super cute! I would love to have best of Pixar...thanks for the chance!! I have my fingers crossed. Hi, Tangee! Love the flowers on your card! Very cute! 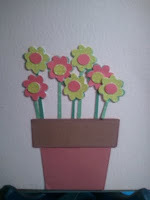 Love the flowers and use of Brads and DCWV paper, I love those stack, glad to see so many used and inspiration!! Very cute card! Love the gate fold and the twine to keep it closed...very nice. The inside is adorable with all the flowers! Great job!! I forget to incorporate folds in my card creations, and your is SO VERY lovely! And the flowers at the bottom on the inside really complete this delightful creation! I just found your blog and am now a follower. So very nice to meet you! Stop by my blog sometime and say hello! What a cool card, love it. Love the card, tfs. I would love the best of pixar cart, thanks for the chance to win it. Very cute card. I love the inside flowers. Cute card. I love the flowers. Thanks for the inspiration. Love the gatefold and twin project - TFS! LOVE LOVE THIS PROJECT...YOU DID AWESOME!!! TFS!!!! SOOO cute - love those flowers!!! I'm a new follower! Super cute. I love the flowers. I am a new follower!! Have been wanting to try the gate fold. I love the card. I love your card! I really love all the flowers! I'm a new follower. I love that you added a fuzzy brad to the center of the flower. It's all the little details that make this card cute. What a cute card! I do love the flowers and the brad was a great idea! Would love to win the Pixar cart!! great job on the flowers! love the little brads. The whole card is pretty! Love your card, Tangee!!! Super cute and the flowers are awesome!! TFS! Love this card!!! Those flowers are soooo cute!! what a nice flower pot card. thanks for sharing. Love the card. You can never go wrong with flowers! Very cute! I love the gate fold card. I am going to have to try that! Love you card and I love the flower border. Very, very cute. Cute Card. You have some neat ideas. Your card looks great. I never made a "gate" card. I will have to try it. What a great idea to use the glue dots for the enclosure with the twine. What cute flowers also. Awesome card! I love the flower pot and the flower borders! Love your Sweet Card!!! !Love how the Twine wraps around the buttons.I have been wanting to try to make a Gatefold Card. I just love yours. Thank you for the Chance to win your Awesome giveaway. Would be great to use with my Grand Children. I love your flower pot and the flowers are adorable. TFS and for a chance to win the great blog candy. Love your blog and cards. Thanks for the chance to win. Happy Birthday Michelle!! I like this card and fold. The flowers are great. I love your card! The flowers are super cute. I am a new follower of yours. 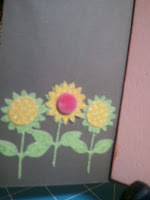 Would love for you to stop by my blog and follow too:) I look forward to seeing all your projects. Thanks for sharing and for a chance at a great giveaway! Love the card the best kind of flowers the kind that wont die lol. Your cards are fantastic. You stamping is great. Super cute card! I love the color of the flowers. Great card!! I love how you used the twine!! Your card is super adorable!!! I love gate fold cards--I just never take the time to make them. I think you have just inspired me to take the time!! I also sometimes forget how much good stuff is on the WIMG cart. Thanks also for the chance to win!!!! Love the gate fold card and all the pretty flowers, would love to win the cartridge...please pick me! LOL! I love this card! It's so cute! I follow on GFC as squiggles87. This gate card is really pretty. 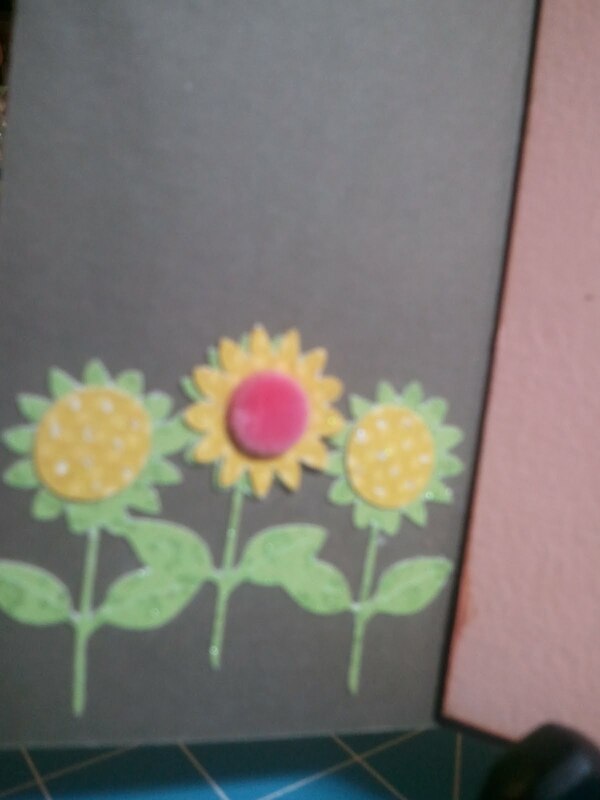 I really like the flowers:) I usually leave all my cards blank on the inside but with this gate card I like how you made the inside with the sentiment and flowerpot. TFS! Love this gate fold card! What a clever way to use twine!! Very pretty card. I love gate fold cards. Very cute card! I would love to have Best of Pixar! Thanks for the chance to win! very pretty card! Thanks for such wonderful ideas! Love the gate fold. And any new stamp can be a challenge but it does give it that handmade look! I have plenty of those myself. Great job. Darling card. I like how it folds and how it closes. I love how you made this card. I think the flowers are placed well. So...great job! TFS!!! Love your blog. I love the flowers! Cute card. What an adorable card! flowers are just so cute! I love this card so cute!!! love the flowers, awesome work! Happy birthday Michelle!! Awesome job with your gate card!! Love the flowers. I'm already a follower. Thanks for sharing. The card is fabulous!! I love the use of the twine to keep it closed! I love the flowers and the flower pot. So cute. Love your card. The flowers look great. I haven't tried to make one of those type cards yet but will have to try. Thanks for the hop and giveaway! Very cute card! Love the buttons! Great job on the card! Flowers are cute!!!! Thanks for the pixar giveaway! Ooo- love the card! The flowers are adorable! Walk in my Garden is one of my all time favs! I love the card. I always love seeing fun cards with carts I have. Very inspirational! Love the card Tangee. Michelle will love it too. Great card! I always wondered what gatefold was. I will have to try making one. Thanks for the great giveaway. I would love to win! Love your card, the flowers are adorable. I am a new follower. I would so love to win this cart. Love your card, it is very cute. I have never made a "gatefold" card but love the look of them, thanks for sharing! Loved this card. My favorite was the terra cotta pot with flowers. Thanks for sharing. Love how you wrapped the twine around the card. What a fun card! I love how it opens to a wonderful row of flowers...my birthday is next week...you can send one to me! Tee hee! Cool card! I love how you used your twine for the closure!! What a cute card! I love gate folds and the flowers in yours is so pretty! I'm sure she'll love it too! I became a new follower and thanks for the chance to win! Such a cute card! Love the flowers! New follower of your blog! Thanks for teh chance to win! Very cute card! I feel like I could make it! I love any type of different folding card! Gate fold, tri fold, side step etc. Love the gate fold card - button closure with twine is a nice added touch! Love the card with all of the flowers - TFS!! Love the gate fold card. You did a wonderful job on your card. I am a new follower. Thank you for sharing. adorable. love the gate fold. i need to try this style one of these days. Cute card! I would like to try a gate fold myself. The flowers are adorable. Nice job! Beautiful card! I still need to try a gate fold card. Thanks for the inspiration! I love the card. I've never done a gate fold card and will have to try one now. I love how you used the twine as a closure. Love the card you made. I love the colors of the flowers :) so pretty! I love your card. Such a fun idea. The flowers are so pretty. Thanks for sharing. Happy Birthday Michelle, you have great Blog friends! Love the card! The flowers are so cute. Love the card, colors are so cute. Thanks for the giveaway. Super cute!! Love the flowers!! Adorable, Tangee! I love ho you decorated the inside just as much a the outside. Very cute!! I love the card, its so cute! love what you did with the twine! 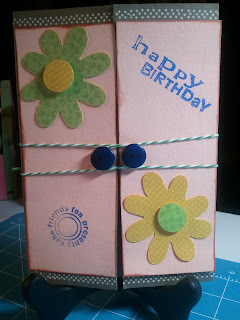 Love the flowers and how you used the twine to hold the card closed! Thanks for the chance to win such a great prize! I would love to see the back of your gate fold card. Where do you have the twine? Does it go across the back or is it tucked under the front layer of the card? LOVE that idea to have it wrapped around the brads, super cute. Your blog Candy is the greatest! I've been wanting this cartridge forever. Adorable card!!! You inspired me to try a gate fold card too now! And thanks for the chance at some GREAT blog candy! Oh, and since you're on lockdown from buying anything else until your E2 is paid for, come check out my blog...it's still brand new, but it's all about how to feed our scrapbooking addictions for little or no money!!! I love your gatefold card. It's inspiring me to make one for the first time. Thanks for the great idea. I became a follower. the floral theme is looking cute.the colour combination of all cards nice and also easy to made.